Taking an opportunity and changing the world. At the beginning of the 21st Century, anyone who knew corn grows on a stalk was at least a little bit smitten by ethanol. He was right. The Great Recession, combined with record high corn prices, several years later abruptly slowed and stopped all manner of business expansion, including the renewable fuels industry. But it was a wild ride on the way up, and the associated Broin Companies that became POET in 2007 enjoyed the trip. 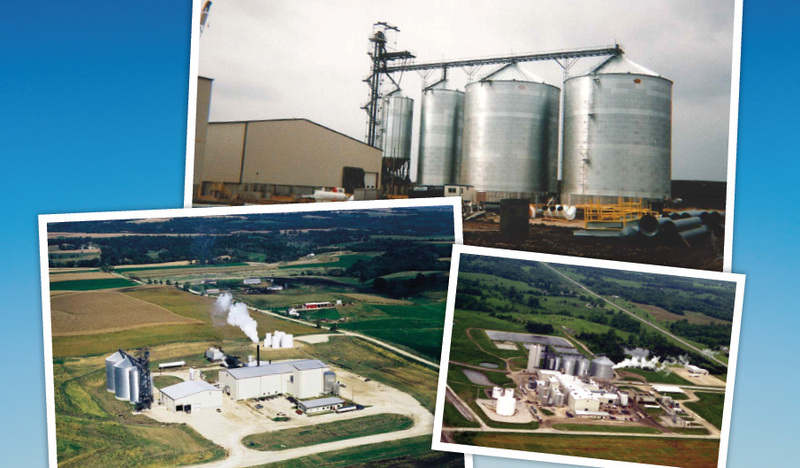 The period from the late 1990s to the recession marked an era of unprecedented growth for the Broin businesses that had been created in the previous decade to build and manage ethanol plants, produce and sell ethanol and to market and develop ethanol and co-products. The Broin team established a profitable, durable business model to succeed in all kinds of economic environments. But the investment climate at the beginning of the 21st Century was rocket fuel for the Broin endeavors. “We were doing one plant a year when I started in 1994. Then two plants a year. Then three plants a year,” remembers Paul Carrette. He was a mechanical engineer with Broin and Associates from 1994 to 2008. At the peak of the industry expansion, Broin had seven plants under construction at once and completed more than $600 million in construction that year. By 2007, Broin Companies had built 34 ethanol plants, including the 27 it manages today. The early plants were sized to produce 10 to 15 million gallons a year, and later these same plants were expanded to 35 to 50 million gallons of annual capacity. Nameplate capacity in later years grew to 40 million, then 65 million gallons per year. As the pace of plant construction in the era ramped up, the Broin team developed methods to keep on track. Carrette was involved in one of these. It consisted of designing and building portions of a plant on skids, some of which were built at the Broin headquarters. These modules were transferred whole to a plant under construction then tied into piping electrical systems to speed construction time and decrease quality issues and mistakes that can occur in the field. “That’s where I was able to add value,” Carrette says. The use of skid modules could trim the building time of a 40 million gallon plant, with its hundreds of valves, more than 100 electrical motors and miles of piping, from 16-24 months to 14 months. “We were setting construction records in the industry,” Jeff Broin says proudly. The ethanol industry was growing and several Midwestern states had seen the potential the industry offered in earlier years and had implemented economic incentives to encourage development. Minnesota’s 20-cent a gallon production credit was especially enticing and made it a logical place for Broin’s plant building boom to get under way. “We followed the incentives around the country,” Broin says. The Bingham Lake plant came on line in 1997, Preston and Luverne in 1998 and Glenville in 1999. Like all Broin plants, they were able to produce ethanol in greater quantities than the plant nameplate, and they were all profitable in their first month of operation. The Broin team honed its business and production models with each venture. Carrette, who worked when Rob Broin was the company’s Chief Technology Officer, recalls the new plants were constantly chasing evolving technology, the fruit of the ambitious Broin research initiative. The plants were engineered not for current production, but for production levels designers knew would soon be possible. Rob Broin along with Todd Broin, who designed the computer control systems for plants, were heavily involved in plant startups. These were seven days a week and could take two months or more. Employees were pre-trained at operating Broin plants. At the same time, Jeff Broin worked with farmer boards of directors at each site. Many times there was already a project underway that was stalled. “I would go in, show them our track record, and work with them to make the project a success,” says Broin. He wrote detailed business and marketing plans for prospective ethanol plants, then he made a compelling case for investment to hundreds of farmers and other investors, many times at dozens of meetings per location. “I knew the hot buttons with investors,” he says. For example, farmer-investors looked skeptically at board members receiving pay. “We took the pay out. I also understood the equity levels the bank would require and how to put together pro forma financials the banks would agree with,” Broin says. At Glenville, after Jeff and the Broin team came on board and helped restructure the project, “we raised all of the equity to build the project at one investor meeting.” In some cases when farmer funds fell short, an LLC was formed and private investors, including the Broins themselves, made up the difference. “Because we were successful at fundraising and getting plants to the construction phase, a lot of other companies and projects began to copy our model to raise funds and dozens of projects began to build in the Midwest. I guess success breeds success,” says Jeff. 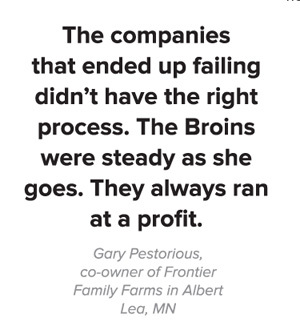 Gary Pestorious, co-owner of Frontier Family Farms in Albert Lea, MN, is a longtime ethanol proponent and has served on the boards of three ethanol plants. As the boom in ethanol continued in the early 21st Century, the Broin team “was extremely aggressive, but they were mindful of what they were doing,” Pestorious says. After making maximum use of Minnesota’s ethanol subsidies, Broin looked south to Missouri, which also had state ethanol production incentives. In 1995, a group in Macon, MO had begun then stalled when raising money for an ethanol plant. “We had every hurdle in the books to jump through,” says John Eggleston, board chairman of POET’s Macon plant. Three years later, Broin came to town and worked with the board to replicate the same model of the farmer-owned cooperative combined with private investment that had worked so well in Minnesota. “No one had ever heard of the new generation cooperative in the state of Missouri before we tried to sell that picture,” Eggleston says. Proponents had raised only $1.3 million over several years before Broin introduced the company’s business model. “The board was tired and I understood that. I convinced them that we could raise the money, then we got to work, sold the stock and built the plant,” Jeff Broin recalls. Macon began production in 2000. “We followed the model of Minnesota,” says Eggleston. “Our success was the ability of the Broin group to guarantee us profitability. That’s basically what they did.” Broin would go on to build two more plants in Missouri. Later, when state incentives were exhausted and 15 million gallon plants were no longer viable, 40 million gallon plants became a reality. “I ran the numbers on the first 40 million gallon plant in America and tested it for financial viability – and it worked. In earlier years, we would never have been able to get the debt for a $60-70 million plant. Due to our success in smaller plants, we could now build a larger, more capital and labor efficient plant with better technology, significantly reducing the need for state incentives,” says Jeff. This decision led Broin Companies to follow the corn to Iowa. Between 2002 and 2007, seven plants were built in Iowa. Broin Companies plants in Michigan, Ohio and Indiana were also under construction during this time. The industry was literally exploding in the middle of the “gold rush” Broin spoke of in the Wall Street Journal. “We kept building but were well aware of the 10% blend wall that was looming and the potential for oversupply and difficult times,” says Jeff. The expansion era in ethanol was a heady time. “There were a lot of 90-hour weeks,” according to Carrette. But ambitious employees then could feel they were doing more than just a job. For his part, Carrette says he didn’t just work with pumps and pipes. He learned to build ethanol plants, as well as how to change the world around him. “When I started, there were eight employees. We had to do everything. You had to understand the whole process really well.” The operative concept at Broin was “why can’t we do that?” Carrette says. From the late 1990s to the Great Recession, Broin businesses had transformed from growing arithmetically to seemingly expanding exponentially. Broin headquarters expanded four times during that era, from 1,600 square feet to more than 40,000 square feet of engineering, management and research space. Additional planes were added to help the team members travel to and from the ever expanding network of plants. Keeping family lives as balanced as possible was important.